When a person is born, they are each given a book. Their fate is from the moment of birth all the way to the point of death to follow what is written in the book down to the exact letter. These books are known as ‘tomes of fate’. Among all of these people, X is born with a book that has absolutely nothing written in it known as the ‘blank tome’. Then one day he meets three others in possession of blank tomes. Their names are Reina, Shane, and Tao, and together, these four set off on a journey to discover their roles in this life. This series is based off of a mobile RPG that came out a few years back. Though the story is interesting and has a lot of promise, the way that this anime starts out is jarring, especially for newcomers to the story. Grimms Notes The Animation starts off in the middle of the story, backtracking later to tell us how Ex first learns of the Chaos Tellers and meets Reina, Tao and Shane. It begins with a story on Red Riding Hood, which is actually interesting because of the twists they’ve brought about for the tale, but then quickly devolves into just one fairytale story after another. 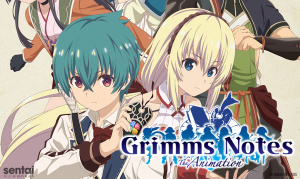 Grimms Notes The Animation seems like it has a good premise, and the animation quality is there as well! However, given how the first few episodes have gone so far, we wouldn’t recommend this anime for anyone other than perhaps fans of the mobile game. X is a young boy who lives in a district and is in possession of a ‘blank tome’. X was born and raised without a single fate bestowed upon him, but then he meets Reina and the others and sets out on a journey with them to determine his own fate. He manifests an ability that allows him to connect to the spirits of all heroes known as Wild Crest. Shane is a young girl who is like a sister to Tao. She’s really hard to understand and she does and says things in her own way, but sometimes, she has this shrewd viewpoint about the truth behind an incident and it helps on their journey. Shane’s in possession of many talents including that she’s a heavy weapon maniac, she really likes customizing things as well, and more. Tao is a big-hearted and free-spirited young boy. He calls Reina ‘young lady’ and accompanies her on her journey to tune Chaostella. He has made some sort of sibling pact with Shane and refers to them as the Tao Family.